It is now 1920, 14 years after what is termed the First Martian War. That event has skewed a different history for humankind. The Woolworth Building in New York is the world’s tallest building. The Schlieffen War is being fought at the Russian Front. King George and his American wife divorcée Wallis Simpson are vacationing outside London, and the Titanic has just sailed into the harbor. For years after the Martians were conquered by Earth’s microbes, each following cycle in which Mars and Earth are closest to each other, there is fear of another invasion. Each time it doesn’t happen, but now, another cycle is beginning. Walter Jenkins, narrator of H. G. Wells’ novel, is now under psychiatric care in Vienna. He sends a warning message to his ex-sister-in-law, Julie Elphinstone, a reporter, and she becomes the unwilling narrator of the second war between the Martians and Mankind. Walter warns that with the coming approach of the two planets, the Martians will try a second invasion. He’s wrong . . . they don’t wait but are already firing their cannons and sending their ships to Earth. At first, everyone is confident. They defeated the Martians once. They can do it again. If the microbes don’t get them, a new weapon, as deadly as those of the Martians’ Heat-Ray, will do the trick. The weapon fails and in short order, Julia and her associates find themselves in a worse situation than before. Morale rapidly deteriorates as those who do not perish in the destruction are rounded up, becoming Martian prey. Perhaps Walter is correct, for this time, the Martians bring with them humanoid slaves who feed on the red weed taking over Earth’s soil. These creatures offer no harm to humans, indeed one saves Julie’s life. Walter wants to negotiate. Those in command decide otherwise. At a first-aid camp, Julie is told she must receive a series of inoculations. Too late, she learns what that involves. In spite of the acts of heroism, sacrifice, and bravery, Julie begins to admit that defeat, the subjugation of what remains of the human race, is inevitable. Even as she runs for her life, she continues sending stories to her newspaper. She’ll meet and befriend brave men and women, some of whom she’ll never see again, many who will give their lives to keep her safe . . . and all to be remembered in sadness and with pride in later years. This novel, authorized by the H. G. Wells estate, very closely approximates the tone and language of the original novel. 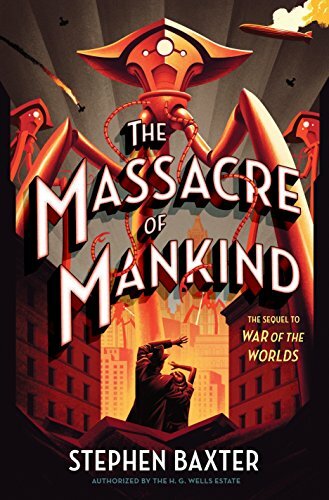 Utilizing some of the characters featured in The War of the Worlds, from narrator Walter Jenkins, this time in a secondary role, to Julie herself, the story has a much vaster sweep. America is also invaded and though their reaction is somewhat different from the British, the plight and resistance of those on the other side of the pond is no less spectacular. Alternating between Julie’s first person narrative and those of her ex-husband, her American friend, and others involved in the fight, a complete picture of the devastation of the world, as well as the plight of individuals is depicted. Ranging from outright heroism to apathy, from self-sacrifice to collaboration, all facets of the human condition during wartime are revealed. Though some readers may consider some paragraphs ultra-verbose in their exposition, even somewhat tedious because of the lack of dialogue, author Baxter has closely approximated the literary tone of the first novel. The only criticism is the use of a deus ex machina, and not human ingenuity, as a savior. Reading the original story and then following it with its sequel would be an extended but entertaining prospect. The War of the Worlds is a classic of early science fiction. The Massacre of Mankind will no doubt soon find itself alongside that timeless tome on bookshelves.